We’d love your help. 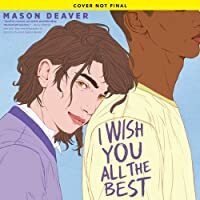 Let us know what’s wrong with this preview of I Wish You All the Best by Mason Deaver. When Ben De Backer comes out to their parents as nonbinary, they're thrown out of their house and forced to move in with their estranged older sister, Hannah, and her husband, Thomas, whom Ben has never even met. Struggling with an anxiety disorder compounded by their parents' rejection, they come out only to Hannah, Thomas, and their therapist and try to keep a low profil When Ben De Backer comes out to their parents as nonbinary, they're thrown out of their house and forced to move in with their estranged older sister, Hannah, and her husband, Thomas, whom Ben has never even met. Struggling with an anxiety disorder compounded by their parents' rejection, they come out only to Hannah, Thomas, and their therapist and try to keep a low profile in a new school. But Ben's attempts to survive the last half of senior year unnoticed are thwarted when Nathan Allan, a funny and charismatic student, decides to take Ben under his wing. As Ben and Nathan's friendship grows, their feelings for each other begin to change, and what started as a disastrous turn of events looks like it might just be a chance to start a happier new life. To ask other readers questions about I Wish You All the Best, please sign up. This books has one of the most wonderful covers I've ever seen. Who is the illustrator? Mason Deaver The art is by Sarah Maxwell! The Mona Lisa was found trembling in the Louvre Museum because of this cover. Well I wrote this book, so my review is probably biased? Either way... this is the book of my heart, I never thought people would believe in this story, but I've never been happier to be so, so, so wrong. This book may be the closest I get to writing myself. It deals with anxiety, depression, coming out and identity, and first love, and it's absolutely so important to me. I hope you all enjoy it when you get the chance to read it. I am finally going to be able to read Mason’s book. CAN YOU BELIEVE??! This book has not been undersold in the least. It is heartfelt, loving, difficult, and wonderful in every way. Becky’s blurb isn’t lying - it is indeed quietly groundbreaking and will, without a doubt, save lives. Prepare yourselves for an incredible, beautiful debut in 2019, friends. A soft, sweet, and incredibly important story about a non-binary teen finding their voice. This book is going to be so important to so many people. The ARC of this book was provided by Scholastic via Edelweiss in exchange for an honest review. I think this book is going to mean so much for so many people. First of all, I think it's important to say that this book is own voices so the author surely knows what they are talking about. This book tells the story of Ben, a teenager who identifies as non-binary. After coming out to their parents Ben is kicked out of their home. Thankfully their sister Hannah takes them in and helps them go throug The ARC of this book was provided by Scholastic via Edelweiss in exchange for an honest review. This book tells the story of Ben, a teenager who identifies as non-binary. After coming out to their parents Ben is kicked out of their home. Thankfully their sister Hannah takes them in and helps them go through some major things. She helps them get into a new school and offers to financially help them, something that Ben obviously needs since they are only a high schooler. I liked how this book was all about Ben and their journey that brought them to forgiveness, to acceptance and in the end to happiness. This story was very character-driven, something I very much appreciated. I loved the fact that the characters talked about pronouns and misgendering and also how they said sorry when they made mistakes. Every time they did that it felt like a small victory in Ben's favour and I was so happy for them because it meant that people were listening to them and were accepting them for who they really are. Because that's the feeling throughout all the book, Ben just wants to be accepted for who they are and I'm happy they found people who do. The other characters were great. Hannah and Thomas are two of the most supportive people I’ve ever encountered in books. They really are good for Ben, especially considering the parents they were living with before all this. The friends Ben makes are very nice, especially Nathan (my little sunshine). I don’t know how the author did it, but I could definitely feel Nathan’s happiness and good spirits radiating from the pages. When Ben was painting Nathan’s portrait and decided to go with yellow I was like: “Well yes of course, what other colour could you use to describe him?” It just felt so obvious to me. I LOVED this. Great representation, pacing, and I haven't shipped two people together in such a long time! This is 4.5 for me though because for some reason, while the writing is great, I felt myself not feeling as emotionally attached to the characters as I'd like to be, but I'm positive that the very minor problem will fixed in Mason's second novel. This is SUCH an important novel (it being the first own voices non-binary experience I've ever read), and Deaver will soon be an even bigg 4.5 stars. I've read this book twice already and I can say with great confidence that I'll be rereading it many times in the future. It is THAT good. I read this one twice already and i can tell y'all it's a game changer. I'm leaving this one unrated because I honestly don't know what to give it. In so many ways it's such an important and relevant read and I'm so happy this'll be out in the world soon and that people will see themselves in it or identify with aspects of the journey described within. But at the same time.. it's not happy, it's often hard, and it's far from your typical fluffy YA -- which, to be fair, was something I knew going into this so I'm not throwing shade or anything; and not that I need al I'm leaving this one unrated because I honestly don't know what to give it. In so many ways it's such an important and relevant read and I'm so happy this'll be out in the world soon and that people will see themselves in it or identify with aspects of the journey described within. But at the same time.. it's not happy, it's often hard, and it's far from your typical fluffy YA -- which, to be fair, was something I knew going into this so I'm not throwing shade or anything; and not that I need all my YA to be fluffy, either. I WISH YOU ALL THE BEST is heavier, dealing with serious topics of identity, coming out, rejection, and the acceptance we all hope for but don't always receive. It's emotional, it's bittersweet, it's painful, but there are moments of lightness, even charm, and a hopeful ending and, again, this book is going to be so so important to so many people. I'm glad I read it. Did I love it? No. But that doesn't negate anything I've already said about this book. And it's also why I'm not rating it. A lack of stars does not, in any way, mean you shouldn't pick this up. You absolutely should. ARC kindly provided by Scholastic via Edelweiss in exchange for an honest review. y'all mind if i SCREAM? I have had the honor of reading this book not once, but twice. Let me just tell you, this is one of the greatest pieces of art I have ever consumed and everyone, EVERYONE, needs to put it on their TBR. I’ll write a proper review closer to when it comes out because it’s being published and that’s what the book and Mason deserve!!!!! I've been seeing my friends hype this up ever since I joined book twitter. Can't wait to finally read it! THIS COVER IS COMPLETELY STUNNING. AND CUTE AF. 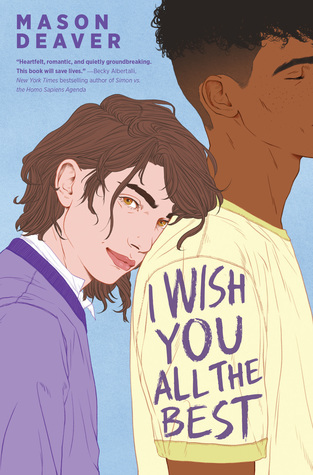 This was such a great book, and is going to mean so much to so many non-binary teens like Ben! I loved how this book dealt with Ben's coming out, even though it wasn't easy to read. From their coming out, the aftermath of it, and then their fear of coming out again and meet the same fate. It felt very real and is definitely something a lot of queer kids probably have to think about. I also just really loved the way anxiety was portrayed here, and the way mental health was given so much importance This was such a great book, and is going to mean so much to so many non-binary teens like Ben! I also just really loved the way anxiety was portrayed here, and the way mental health was given so much importance. Even though Ben didn't want to see a therapist, I loved the nuanced and realistic way therapy, medication, and anxiety was depicted. Probably my favourite, favourite part of the book though was Nathan and Ben's relationship! Because it was presented as something really bright and hopeful (because that's what Nathan is). I really loved the way their relationship developed from Ben being annoyed by Nathan's personality to their supportive and trusting relationship. I also just loved cinnamon roll Nathan! This book is also super diverse!! Which still feels so rare to see! There are lots of queer and non-queer kids of colour which was great! The book of my dreams. The book of my heart. Woooooooow!!! This was such a stunning story. Highly recommend pre-ordering when that link drops. 2019 is about to be so lit. A non-binary mc !! How have I only just heard of this book? I CAN'T WAIT TO READ MASON'S WORDS! CAN'T WAIT TO MEET MY ENBY CHILD AND MELEIKA (YES, I AM THEIR NAMESAKE). I CAN'T WAIT! Mason has come so far and I've watched their journey online stemming from an idea, to snippets, to getting an agent, and to getting a book deal! I'm so proud of my friend. Mason Deaver is a non-binary author and librarian in a small town in North Carolina where the word ‘y’all’ is used in abundance. When they aren’t writing or working, they’re typically found in their kitchen baking something that’s bad for them, or out in their garden complaining about the toad that likes to dig holes around their hydrangeas.